Researchers at the Department of Immunology publish groundbreaking proteomics technology in Nature Methods. How do cells keep their assembly lines in synchrony? 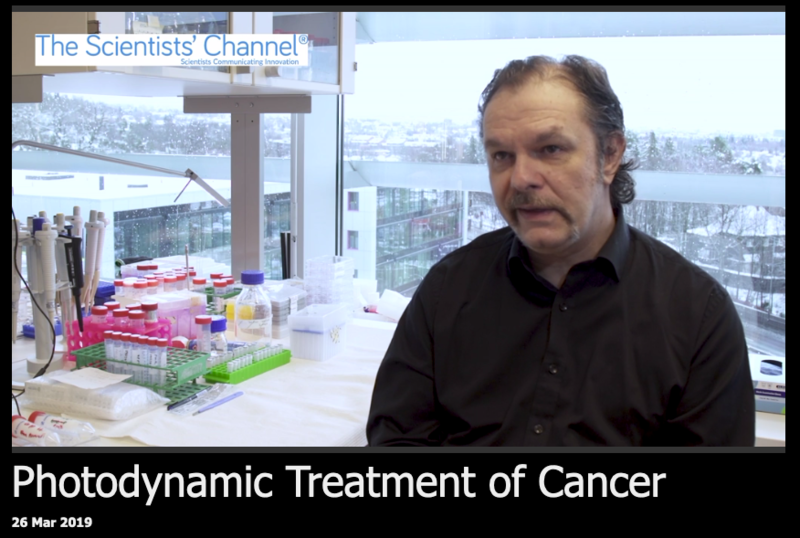 Jon Amund Kyte "Researcher of the Month"
The discovery of TIGIT as a potential new target for immune checkpoint blockade is published in Clinical Cancer Research. Core Facility for preclinical imaging (MRI and IVIS). What services can we offer? What is the cost of a cancer patient's life? The Department of Pathology receives funding for melanoma research through Horizon 2020 project. PhD students and supervisors: the fast tracks to perfect synergy? Institute seminar 19th of December. NB: 10-11 a.m.
Centrosome and Cilia biology-project headed by Sebastian Patzke highlighted by "Helse Sør-Øst"
Linking genotype to phenotype in cancer: proteostasis and metabolic reprogramming"
Prescriptions of antibiotics in the primary health care; the role in evolution of antibiotic resistance? Personalized Cancer Medicine  Same Old Brand New Concept? Miriam Ragle Aure first author on article chosen as "editor's pick" in this month's Genome Biology. Defends thesis Nov 27. Research leadership: The gateway to success? Kavaliauskiene and co-workers publish "Cell density induced changes in lipid composition and intracellular trafficking"
A newly identified mitochondrial enzyme protects against obesity. Mapping the cooperation between life's "molecular machines"
Paper from Wiedlocha group published in "Science Signaling"
Elastography research covered by "Science Daily" and "Apollon"
OUS-led national personalised cancer medicine project granted generously by BIOTEK 2021. Work from Einar K. Rofstad's group presented as "Research project of the month"
Personalized medicine in clinical practice  is it feasible? Malerød and Pedersen with cover story in Traffic. Centre for Cancer Biomedicine and Centre for Immune Regulation ranked "exceptionally good"
Figure from Viola Lobert paper on the cover of "Physiology"
Infrastructure grant to researchers at Institute for Cancer Research. Research by Kirsten Sandvig highlighted in Lab Times. Jørgen M. Aarøe: Epigenetic changes and regulation in breast cancer development - clinical implications? Meeting 21-22 March on "Carcinoma in situ of the breast"
Prof Werner Franke: "Governmentally supported criminal systems in sports (Doping): The roles of MDs and scientists." Important findings from Stokke's group published in "Cell Cycle"
Guest seminar on "Mitotic Exit Phosphatases in Yeast"
How can the use of advanced molecular techniques contribute to introduction of personalized medicine in cancer diagnostics and treatment? Postdoc Forum, Thursday 28 October, at 14-15.15. Paper from Johanna Olweus group published in "Leukemia"
Focus on article from Børresen-Dale's group in "Nature Reviews Cancer"
Viola Lobert discovers functional importance of integrin degradation. Commented on the Cell Migration Gateway. Paper from Anne-Lise Børresen-Dale and co-workers published in "Science Translational Medicine"
Sandvig group with review article in "Nanomedicine"
Article from Andreas Brechs project group on the cover of "Histochemistry and Cell Biology"
Petter Andreas Steen awarded the first "Researcher of the Month" prize from "Helse Sør-Øst"
Newsletter no. 2 from the new "Clinic of Cancer and Surgery"
Newsletter no. 1 from the new "Clinic of Cancer and Surgery"
Trial lecture and disputation October 12-13. Anders Opdahl, MD, PhD-student, first author of article published in "Circulation"
Cancer research project headed by Johanna Olweus presented on the front page of "Dagbladet"
Figure from Rofstad group article on the cover of "Neoplasia"
"New" research web portal for "Unit Rikshospitalet"
Structures of Endonuclease V in complex with DNA reveal molecular basis for repair of deaminated bases in DNA. Espen Enerly co-author important article on p53-repressed miRNA published in "Molecular systems biology"
Figure from Petras Juzenas article on the cover of "Advanced Drug Delivery Reviews"
New research strategy and organisation in "Helse Sør-Øst"
Illustration from Anne Simonsen article on the cover of "Autophagy"
Editorial in Cell highligths paper from Rusten and co-workers. Åste Søvik: doctoral disputation June 15th, and paper selected for high-lights in IJROBP. "Intracellular Transport and Signal Transduction in Cancer Biomedicine"
Important paper from Eivind Hovig's group on the new topic "Genomic DNA melting profiles"
A novel mechanism of growth regulation has been discovered. Article from Fang Liu awarded by "Helse Sør RHF"
Johan Moan elected member of "The Royal Norwegian Society of Science and Letters"
Illustration from Sioud article on the cover of "Journal of Molecular Biology"
Article on classification of GISTs by array CGH published in "Cancer Research"
Paper from the Olsen group nominated by "Physics in Medicine & Biology" for inclusion in "Highlights of 2005"
Novel method estimating absolute number of transcripts published in "Nucleic Acids Reseach"
Paper from the Sandvig group at the front page of FEBS Journal. 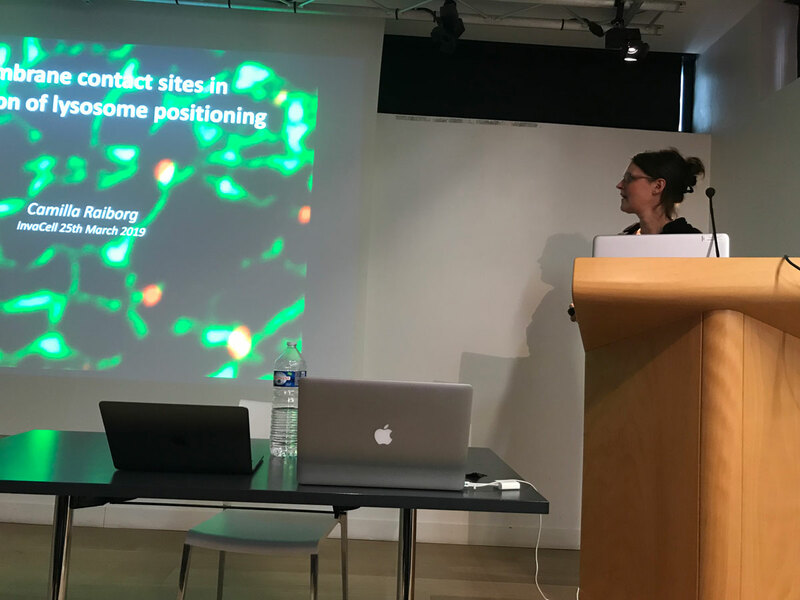 Mohsen Shadidi has defended his thesis "Affinity selection of cancer cell-binding antibodies and peptides from random libraries"
Anita Langerød has defended her doctoral thesis, on the subject "molecular profiling of breast cancer". Article from the Stenmark group selected "JBC Paper of the week"
Harald Stenmark new member of the Norwegian Academy of Science and Letters. Morigen has defended his thesis "Regulation of chromosome replication in E. coli: interaction of DnaA with oriC and the datA site"
Camilla Skiple Skjerpen has defended her thesis "Translocation mechanism and cellular interaction partners of FGF-1 and FGF-2"
Lecture by Thomas J. Fahey Jr.